It's more than Photography it's an experience! How to turn into a mermaid is a question many have been asking for many years. Here at the Mermaid of Hilton Head we understand this question and have come up with a great answer for you. We have made many dreams come true with our Turn into a Mermaid Photography. How to turn into a mermaid is simple, you can join us on the beach in Hilton Head Island, SC or when we travel around to different cities. See below if we are scheduled to come to a city near you. If we are not, send us an email and let us know where we should be going next. Becoming a Mermaid does not have an age limit on it. We have had babies that were 3 weeks old to moms in their 30s & 40s to grandmothers in their 60s & 70s. This is a great experience for all ages! Turning into a mermaid is easy and it starts with filling out the form on our website. Once the form has been filled out, we will contact you with our availability for the dates you requested. Once a date and time are agreed upon, you are one step closer to turning into a mermaid! Once the day has arrived that you turn into a mermaid, you will meet us on the beach and let the transformation begin. We get you fitted for a mermaid tail and help get your mermaid hair ready with a starfish hair piece. Then, you get to the ocean or studio background, and you are now ready for your mermaid photoshoot. By this point, you have officially turned into a mermaid and are ready for your debut. Our past mermaids have told us on numerous occasions that the day they turned into a mermaid was one of the best days of their lives. Young children light up and don’t stop smiling when they have their tails on and older women tell us this was the first time they have felt this good about themselves in a long time. We are not just photographers who turn you into a mermaid - we make dreams come true. We get asked all the time: “How can I turn into a mermaid?” and we pride ourselves in bringing this dream to a reality for so many people. 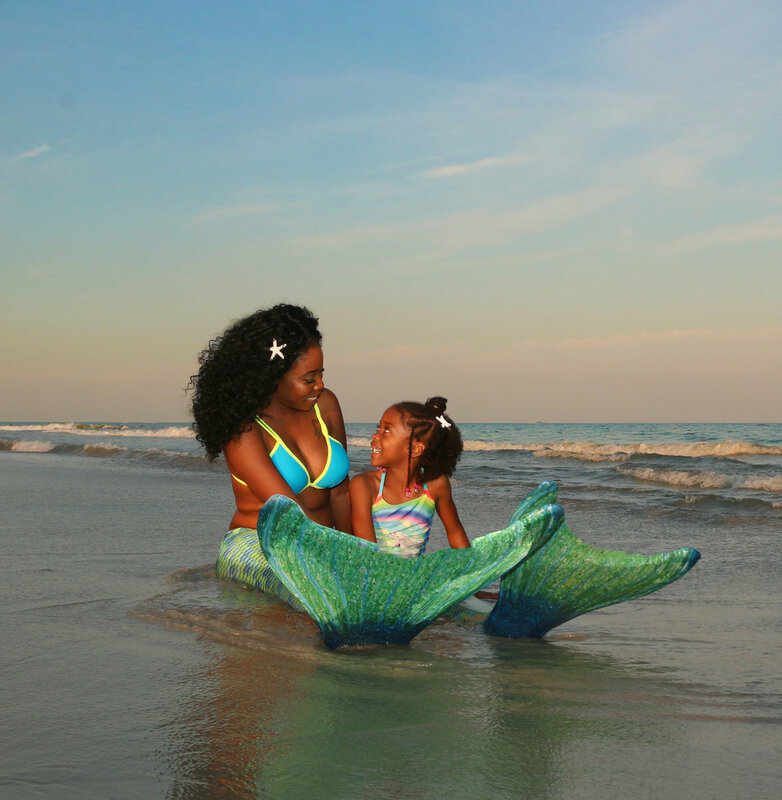 We make the experience fun and magical for mermaids of all ages. The magic doesn’t end once you are done turning into a mermaid. All of the images are professionally edited and the magical experience is enhanced and brought to life for memories that you will have for years to come. Turning into a mermaid really is simple and starts with the click of a button on our website after you fill in the form. The opportunity to turn into a mermaid, which many people have dreamed of for years and years, is finally here and we are proud to be the company to bring your dreams to life. What are you waiting for? The time to make your dreams come true is right now! Turn into a Mermaid - It's more than Photography it's an experience!